Choosing an aluminium gate from Everlast Services has never been simpler. We offer a strong and durable range of products that can suit all of your entry gating needs. You can be completely confident that if you install one of our aluminium gates at your family home, you will be 100% protected. As a material, aluminium is light and very easy to install – this makes it ideal for a range of properties. It is also a material that is not at risk of corrosion, so if your neighbourhood is often exposed to harsh weather elements, aluminium might be the perfect option. Another substantial benefit of this material is that it is a relatively cost-effective alternative to steel. The rising cost of steel has allowed aluminium to really stand out from the pack. It also doesn’t hurt that it is 100% recyclable. Because we design and manufacture all of our products out of our Melbourne factory, we can tailor your entry gate to your specific design needs. We can customise every facet of your order, from colour to material, size and pattern, making it so you’re completely satisfied. We are also more than happy to give you a free, no obligation quote. We can visit your property to give you a more detailed insight into our work, designs, conducting an inspection to ensure we find the best gate to suit your needs. We design and manufacture directly out of our Hoppers Crossing factory. Because of this, we can oversee the production of our gates and ensure everything is of the highest possible standard. Because of this, we are able to stand behind the quality 100% and deliver you the best possible outcome. All of our materials are proudly Australian made and owned. With over 20 years experience in the gating and fencing industry, our expert knowledge can be directly applied to all our your needs. We have tackled every problem under the sun, so we know we can handle anything you throw at us. As well as being a leading fencing and gate contractor in Melbourne, we are also a steel wholesaler and fabricator. What this means is that we can design and manufacture all the parts for your metal gate (inlcuding frames, posts, etc), selling them directly to you. This cuts out the expensive middleman costs, making our products cheaper when it comes to purchasing. 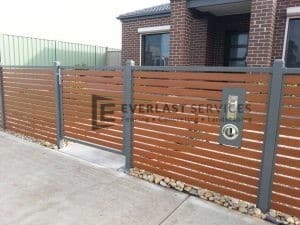 If you are in the market for an aluminium gate, then Everlast Services is the company to call. We have over 20 years experience in this industry, so let us help you with your next project.